The two best known Maverick brothers, Bart and Bret. 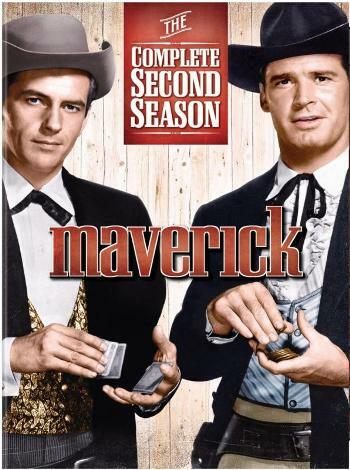 Maverick is a Western TV series that ran from 1957 to 1962. It starred James Garner as Bret Maverick, a gambler and conman travelling around the Old West seeking a quick buck and (more or less reluctantly) helping the helpless. Later episodes introduced other members of the Maverick clan: brother Bart (Jack Kelly), English cousin Beau (Roger Moore), another brother, Brent (Robert Colbert), and, in one episode, father Pappy and uncle Bently (Garner and Kelly again). Diane Brewster had a supporting role as Samantha Crawford, the recurring love interest/nemesis of the Bros (and one of several Drop-In Characters throughout the series). Unsuccessfully revived twice: Young Maverick (1979, starring Charles Frank as nephew Ben Maverick) and Bret Maverick (1981, with Garner returning as an older and more settled Bret). A film version was made in 1994, with Mel Gibson as Bret Maverick and James Garner in a supporting role. Affectionate Parody: The famous episode "Gun Shy" takes aim at all things Gunsmoke. Towards the end of the series, "Three Queens Full" did something similar for Bonanza. All Your Powers Combined: "Shady Deal At Sunny Acres" features Bret, Bart and all the recurring characters up to that time. Artistic License  Geography: In "The Relic of Fort Tejon", said relic, a camel named Fatima, is referred to as a "full-blooded Arabian mount". Fatima is a Bactrian camel, native to Central Asia, as opposed to an Arabian dromedary. The Butcher: Bret Maverick was once stalked by a gunman calling himself "Terrible Fred" and "The Butcher". He turned out to be a wannabe gunfighter who had in fact been a butcher. Casino Episode: Bret Maverick included a two-part episode called "Faith, Hope, and Clarity" which involves the title character directing a sting to help the townsfolk get their land back from a guy that cheated them out of their land titles. The Massive Multiplayer Scam involves the townsfolk setting up a casino on the second floor of the local saloon, including knocking out walls between bedrooms to make a larger space. Character as Himself: In the episode "Pappy", James Garner plays Bret and Bart's father, while Jack Kelly plays Uncle Bently Maverick. Pappy is listed as "? ", while Uncle Bently is listed as "Himself". Divergent Character Evolution: Starting late in the first season, episodes started to alternate between focusing on series mainstay Bret Maverick (played by James Garner) and his brother, Bart (played by Jack Kelly). Although Bret and Bart were written identically (writers were told to always write for Garner, and the producers would later just select which character would lead due to scheduling), the actors' portrayals quickly established Bret as the fun-loving, wisecracking brother, and Bart as the more serious-minded of the two. The same process happened to a later Maverick as well, as Roger Moore played Beau Maverick as a refined gentleman, at odds with the other two brothers' portrayals, despite the character, again, being written exactly the same. As for the final Maverick brother (Robert Colbert as Brent Maverick), he only appeared in two episodes, and thus never really found a personality of his own. Family Title: The series is named for the last name of the family of protagonists. Historical-Domain Character: John Wesley Hardin, in "Duel at Sundown". How We Got Here: Many episodes start with a teaser of a dramatic moment that will occur around 30 minutes in. Identical Grandson: In the episode "Pappy", James Garner plays Bret and Bart's father, while Jack Kelly plays Uncle Bently Maverick. Lovable Coward: The entire Maverick clan have made cowardice their family motto for generations. Massive Multiplayer Crossover: During the course of the episode "Hadley's Hunters", Maverick ran into people from Lawman, Cheyenne, Bronco, and Sugarfoot, and he stopped by the office from Colt .45 but nobody was home (a reference to the show being recently canceled). Maverick also crossed out into other Massive Multiplayer Crossovers, the film Alias Jesse James and the TV movie The Gambler Returns. One-Word Title: "Maverick" is one word. Our Love Is Different: The episode "Duel at Sundown" has this happen to the daughter of an old family friend, who falls for a young gunslinger played by Clint Eastwood. It's unclear whether she's right or being played for a sucker until halfway through, when the man visits his other girlfriend and they discuss how his plans to seduce the old man's daughter and gain access to the ranch are going. Professional Gambler: The Mavericks are an entire clan of professional gamblers. Revival: Young Maverick and Bret Maverick. Neither lasted more than a season. Although Bret Maverick has the distinction of airing on NBC three times: the original one season run in 1981-82, then again a few years later as "new" programming to fill spaces in the schedule during a writer's strike, and finally once more for a few weeks in 1994 as promotion for the Mel Gibson movie version. Shout-Out: One of the Beau Maverick episodes is set in Virginia City, Nevada, during the mining rush, and has as a supporting character a journalist named Clem Samuels — a shout out to Samuel Clemens (aka Mark Twain), who really was working as a journalist in Virginia City during that period. Significant Reference Date: Bret Maverick's birthday is the same as James Garner's. Suspiciously Similar Substitute: Bart, Beau, and eventually Brent were all literally playing parts that were written for Bret; the differences in characterization were all down to the performance. Brent is a standard Similar Substitute, added after James Garner left the series, but the other two were added while Garner was still with the show; having a stable of interchangeable leading men allowed the producers to accelerate the show's production schedule by shooting multiple episodes simultaneously and assigning each episode to whoever was available. It also applies to recurring characters - after Diane Brewster and Efrem Zimbalist Jr weren't available to play their respective roles of Samantha Crawford and Dandy Jim Buckley (another con artist, but one with less ethics than the Mavericks), other similar characters began to appear (like Richard Long's Gentleman Jack Darby and Mona Freeman's Modesty Blaine). Theme Naming: All the Mavericks (with the exception of Uncle Micah in "The Maverick Line") have first names beginning with the letter B. Theme Tune Cameo: In one episode ("Trooper Maverick"), Bart whistles the theme song while cleaning a rifle. What Would X Do? : "Like my Pappy always said..." - or, in the case of Beau, "my Uncle Beau."